Published continuously since 1876, Appalachia is America’s longest-running journal of mountaineering and conservation. The journal comes out twice a year, on June 15 (Summer/Fall) and December 15 (Winter/Spring). Save 35% off the cover price with a 3-year subscription! Subscribe by January 15th to receive the Winter/Spring 2019 Issue. 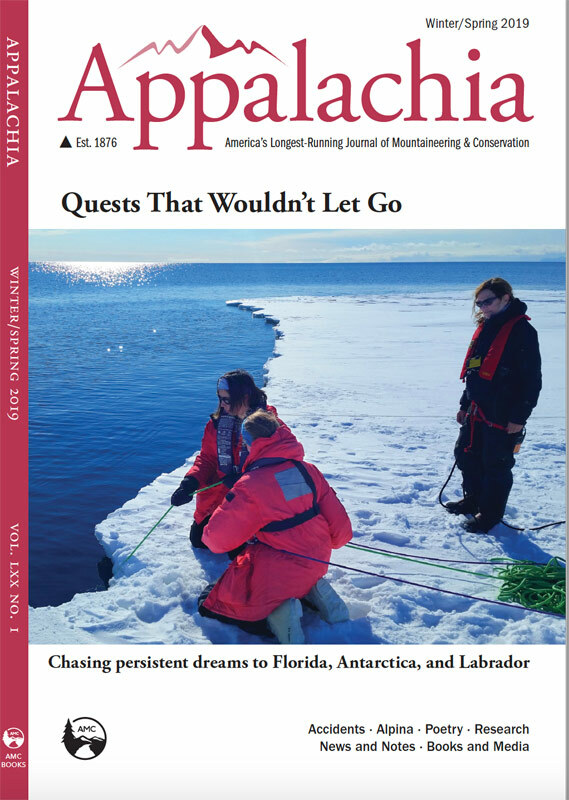 It’s not too late to get your copy of Appalachia! Order a copy through the AMC Store. Subscribe by January 15th to receive your copy of the Appalachia Winter/Spring 2019 Issue. Published continuously since 1876, Appalachia is America’s longest-running journal of mountaineering and conservation. Each issue delivers inspired writing on mountain exploration, ecology, and conservation; news about international mountaineering expeditions; analysis of northeastern mountaineering accidents; poems by leading poets such as Robin Chapman, Wally Swist, and Mary Oliver; and much more. The journal appears twice a year, on June 15 (Summer/Fall) and December 15 (Winter/Spring). You can follow Appalachia on Twitter at @AppalachiaJourn. Christine Woodside, a writer and editor based in the lower Connecticut River Valley, has served as editor-in-chief of Appalachia since 2006. She writes about backcountry adventure, environmental change and how people cope with it, and American history. Chris welcomes letters and feedback from readers, and can be reached at christine.woodside@gmail.com. Learn more about Chris at chriswoodside.com. Appalachia welcomes narrative, historical, and science essays on the following topics: mountain, wilderness, and backcountry adventure; technical climbing; canoeing and kayaking; nature and climate change; and land ethics. We work far ahead and publish twice a year. We consider it our mission to encourage and work with new writers, as well as seasoned ones. The editor-in-chief solicits most lead feature stories several months ahead. Story proposals should reach the editor-in-chief eight months ahead of publication: April 1 for December publication, October 1 for June publication. Manuscripts sent on speculation may arrive as late as seven months ahead of publication: May 1 for December publication, November 1 for June publication. Letters to the editor, suggestions for obituaries in our “In Memoriam” section, and short items for our “News and Notes” section may arrive five months ahead: July 1 for December publication, January 1 for June publication. Our philosophy is that articles should be as long as they should be. Most articles run between 1,000 and 3,000 words. Some measure as short at 500 words, and our longest are 5,000. Please double-space your document, use Times New Roman 12-point font, and send submissions electronically, if possible. Photographs or drawings accompany most of our articles and are usually provided by the authors. We also publish a limited number of standalone photos that evoke the mountains, and we welcome high-quality freelance submissions. Original poems about the above topics are also welcome. Shorter poems are preferred. Only eight poems are published per issue, which makes this the most competitive section of the journal; on average, one in 50 submissions is accepted. Send poems to the attention of Parkman Howe via the editor-in-chief. All work is subject to editing. We make every effort to work cooperatively with authors in the early stages of production and to explain editing decisions. Deadlines usually make last-minute communication with authors impossible. E-mail story ideas, speculative material, and poems to Christine Woodside, editor-in-chief, at christine.woodside@gmail.com. You can also send her postal mail c/o the Appalachian Mountain Club, 10 City Square, Boston, MA 02129. Mailed material can be returned upon request if you include a postage-paid envelope. We have a very limited budget and cannot pay for most unsolicited material. Authors receive two contributor copies. Authors retain the rights to their work, although Appalachia reserves the right to publish stories or excerpts online indefinitely.